How can I prevent my labels from getting reflected? The left triangle is the image of the right triangle about the vertical line in between them as the mirror. I only want geometric objects and label position (but excluding their labels) to be reflected. 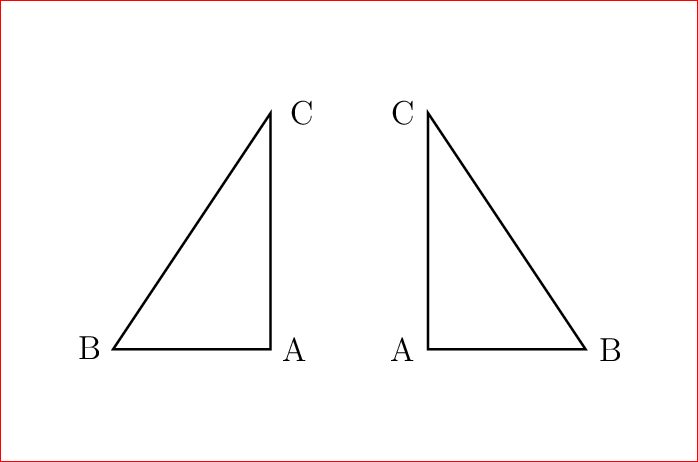 How can I prevent the labels of the left triangle from being reflected? The output I want to get is as follows. Please don't suggest me to separate the left and right object by defining an individual macro for each because my real scenario needs reflection technique and I also want to adopt the DRY principle (Don't Repeat Yourself!). I also tried the following but it does not help. How to follow the DRY (Dont Repeat Yourself) in multidoc?